in this age of kali. While chanting we think when are these rounds going to be finished; the reality is, never, it will go on for ever. Sri Caitanya introduced the congregational chanting of the Holy Name on a large scale as the process to attain spiritual perfection in this age. The brahmanas were inviting Sri Caitanya Mahaprabhu for lunch, but the Lord refused and said I will only take my meals in the house of a "lakhpati". This title is generally reserved to indicate a wealthy man who has at least a hundred thousand rupees. The brahmanas had no access to that kind of money so they felt very disappointed. 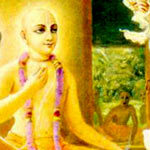 Then Sri Caitanya Mahaprabhu continued and gave His definition of a "lakhpati". He said; "I consider anyone who chants a hundred thousand names daily to be a "lakhpati". From that day on all the brahmanas began to chant a hundred thousand names, the equivalent of sixty four rounds, a day and Sri Caitanya Mahaprabhu was pleased with them and accepted prasadam in their homes. In the Siksastakam, the eight prayers, which are the only written words left by Sri Caitanya Mahaprabhu, the Lord does not merely speak of one lakh of names a day as the desired quantity of chanting, but rather He speaks of kirtaniyah sada harih, to always chant the Holy Name of the Lord continuously. That is the real goal to strive for. Therefore this Hiranyakasipu thought himself to be very intelligent and wanted to cheat Krsna and His servant, but he was cheated actually. 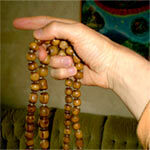 What is the position of a devotee who consistently fails to chant the prescribed sixteen rounds? This question was asked to Srila Prabhupada on a morning walk and he replied, "He is an animal." So we are simply blessed by Srila Prabhupada, that by chanting a minimum of sixteen rounds daily and following four regulative principles we become eligible candidates to purify ourselves to the process of bhakti yoga and to ultimately go back to Godhead at the end of this life."